My practical training at Snow Fun Safaris in Ylläs was a great experience. I was able to do many different tasks with a good team. This was my first work experience in this kind of a field, so I was happy that I had an opportunity to work with a team or in pairs. This way I was capable to observe, learn and then do it myself with more knowledge. 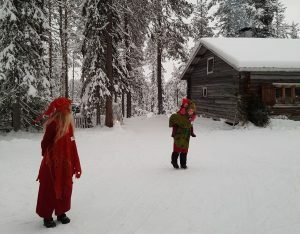 When the season started, I was mostly working as an elf at Elämänluukku with fellow elves. During the month of December, I had quite a lot of schoolwork to do, which took a fair share of my free time. After Christmas, I took part as an assistant guide in many different safaris, such as snow mobile, husky- and reindeer, cross-country skiing, and snowshoeing and ice fishing. 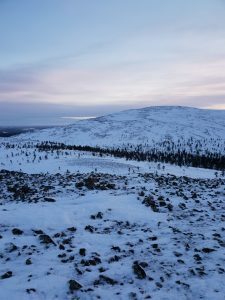 There are many things to do in Ylläs also during the free time. Various outdoor activities, a couple of good restaurants and few shops. Personally, I often preferred to relax after work, go to sauna and sleep well. Approximately once a week the company had a booked sauna and ice-swimming possibility by the lake and it was absolutely one of my favorite things during my spare time. 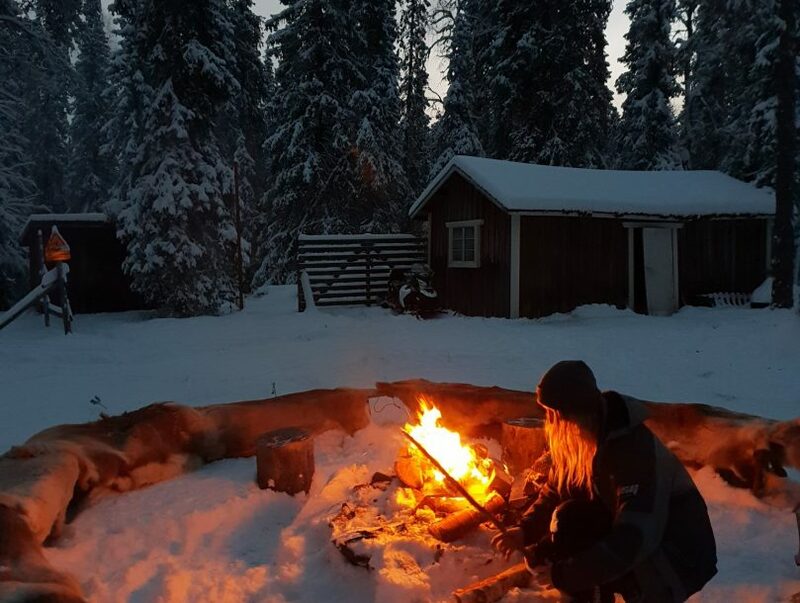 I also really enjoyed the outdoors and surroundings in Äkäslompolo village, Ylläs, and over all would recommend this experience to others! My internship was also at Snow Fun Safaris in Äkäslompolo, Ylläs. The village is familiar to me because my family has had a cabin there for years. I was lucky to go and spend the winter season there. In December, I worked as an elf and my responsibility was to teach kids to ride mini snowmobiles. It was a great task and I had lot of fun working with kids and keeping the Christmas spirit alive. After Christmas, I worked in many different safaris as a trainee guide. I always worked with more experienced guides. I was like a sponge trying to soak up knowledge in every chance I got. Two of my favorite safaris were snowshoeing to the top of Kuertunturi and the Northern lights safari with snowmobiles. In the first one, we took customers to the top of Kuer with snowshoes and while walking we told them about the fauna and flora in Lapland. At the top we had a break with berry juice and coffee from kuksa (a wooden cup used in Lapland) and we enjoyed the beautiful landscape. Northern lights safari is one of the shortest safaris in distance, about 20–25km. During the safaris, we drove to a kota (a wooden hut in Finnish) in the middle of the forest, made a fire and had warm drinks. We guides told stories and myths about northern lights and kuksa cups. Unfortunately, during the safaris where I was working, we did not have a chance to see any northern lights, which was a bummer, but the customers still enjoyed staying in the hut, hearing stories and asking questions from us. My internship has been really fulfilling and I have acquired experience from working as a guide with groups. 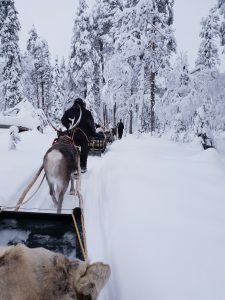 I would recommend working in Lapland for the winter season for everybody.